-I am sick of boring food blogs. This is a how-to (also a how-not-to) that encourages would-be bloggers to be...wait for it...original. I look forward to the next entry in this series: how to give would-be bloggers advice. This pair of birds is a before-and-after like the venison rolls, and from the same source. Same moody lighting, same approach to framing and composition, same startling juxtaposition. I am not really sure what is going on in the background of this one. 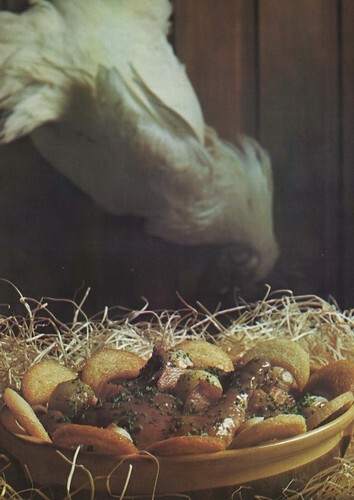 Is that white plumage trying to escape the fate of being slaughtered, plucked, and braised in Burgundy wine? And should the creature be comforted by the thought that in death it will return to the nest before being consumed by its hungry killers? One commenter said of the venison shot that it is "provocatively somber." I gather she would say the same of this one, and yet I find both of them to be darkly comic as well. If pictures could talk, I think these would chuckle heartily and proclaim that it's good to be at the top of the food chain. The New Complete Book of Cookery, (New York: Weathervane Books, 1970), 146. Photo by Ben Ericksson. This image is so simply orangey-perfect that my words could not possibly add to its power. Photo credited to Sunkist Growers, Inc. In the Nov. 13 New Yorker, Rebecca Mead reviews Alex Kuczynski's Beauty Junkies, a "memoir-exposé" about cosmetic surgery. Over the course of a decade, starting at the age of twenty-eight, [Kuczynski] received Botox and collagen injections, microdermabrasion, liposuction, an upper eye-lift, and a shot of a mucuslike substance called Restylane, which left her blubbering into a mug of vodka while sitting on her bathroom floor, her upper lip accidentally inflated to "the size of a large yam." Would you take it as a compliment if someone compared your face to a slice of fatty, salty ham? A little extra: I had a Culinary Metaphor Watch, Election Edition in the works but blogger helped me inadvertently delete it. Is anyone using the new blogger? Is the new blogger less likely to screw things up as the old blogger sometimes does? Anyhow, it was about how the right is associated with manly meat and potatoes and the left with girly-man food. I had a great quotation from a CNN Crossfire episode where Bob Novak talks about how much he enjoys burgers and Paul Begala proudly declares his love of Cobb salad. Then there was a right-wing editorial in the Chicago Tribune about John Kerry's moronic botched joke that contained a derisive line about Kerry existing on a diet of lentils and diet soda. And I was going to talk about the old idea of liberals as the "Brie and Chablis" set and refer to Geoff Nunberg's book Talking Right and Tom Frank's What's the Matter With Kansas? Anyhow, I intended to recreate that entry but then the election came and went and the urgency isn't there any more. Now that the Dems have more power, it seems less appropriate to kvetch about Rove-style kulturkampf. Trust me, though, it would have been killer. Since this photo has only the caption in the title above, we are left to play Name That Cheese. The ones in packaging help us out (Breakstone cottage cheese, Oka, Bel Paese), as do the ones with names printed on the rind (the biggest is called Cellasco). You can see the cheeses better if you view the photo large. Where is Parmigiano-Reggiano? Is it (or something like it) next to the pasta and the cheese grater? Where is fresh mozzarella and goat cheese? I'm not saying these things aren't there, I just can't identify them. But it seems possible that in the early 1960s, one didn't often find these items in the U.S. What else is missing? 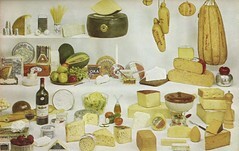 What I like best in this photo are the little extra items planted among the cheeses. The papaya, of course, and the fondue dish. The open bottle of wine. And the garlic, back when garlic was almost taboo. 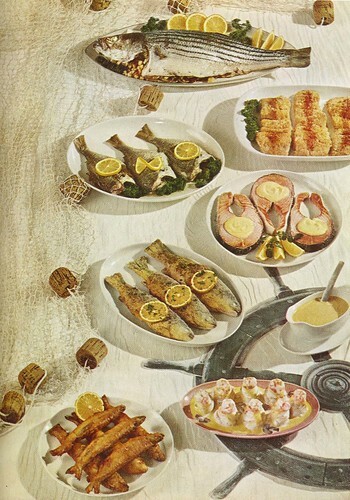 If this image from the original (1961) edition of The New York Times Cookbook had been captioned "the basic ways of serving fish" then there would have been only four dishes: fish with lemon, fish with parsley, fish with lemon and parsley, and fish with neither lemon nor parsley. The actual description reads, "Top to bottom: baked stuffed bass, breaded haddock fillets, broiled porgy, poached salmon with Hollandaise sauce, trout meunière, sole in white wine sauce, deep-fried smelts." Everything on that table looks good enough to eat even after more than forty years, though I'm guessing some of you would pass on the fried smelts. It's too bad that they have such a dirty, industrial name. Would they be more tempting to you if we called them something sweet and made-up, I don't know, say, tilapia? The blustery confidence of suggesting that there are exactly seven ways of preparing fish is utterly charming. Of course fish can also be put in a soup or stew, a mousse or pâté; they can be smoked (hot or cold) or steamed. One might add "grilled" but I think "broiled" was supposed to cover that territory. Aside from the lemons and parsley, my favorite thing in this shot is the fishnet. I especially like how the haddock plate and the Hollandaise boat are cut off to make room for it. I would like the captain's wheel better if it looked real. 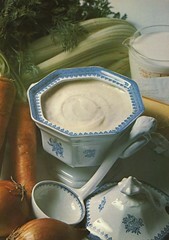 Craig Claiborne, ed., The New York Times Cookbook (New York: Harper and Row, 1961), 244. Some might regard this as the triumph of tasteful over tasty. Perhaps this includes my new friends from Epifurious, who share my interest in old food photos. (Their Thanksgiving dinner shot from the Mondale Family Cookbook, link, is the sort of thing you might contemplate for hours.) But only ignorance of culinary history and practice could produce a true horror of béchamel (or of mayonnaise, its cold cousin in French white sauciness). Without béchamel we would have no proper tuna casserole, macaroni and cheese, moussaka, lasagne, chicken pot pie, and a hundred other classics I cannot live without. Just because some people make it badly doesn't mean it's always bad. The photo might not make your mouth water. I don't think you're supposed to fantasize about breaking off a rib of celery and dunking it in. But the effort to show off this essential item deserves a little admiration. 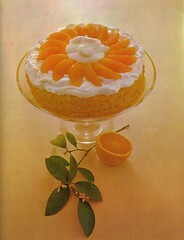 The New Complete Book of Cookery (New York: Weathervane, 1970), page 49. These Penguin paperbacks published in 1975 (Grigson, Fish Cookery) and 1969 (Hanbury-Tenison, Soups and Hors d'Oeuvres) might at first glance seem simply understated, eschewing the the lush, evocative scene-setting--the fireplaces aglow, porcelain tureens brimming, tables spread with outlandish bounty--of so many food photos of yesteryear. But their restraint is deceiving. These covers have in common with many non-food Penguin editions of the same era the signature sans serif type, a fondness for bold colors (though not the Grigson so much), and a playful sort of geometrical abstraction. Compare with this, this, or this. A whole photoset of Penguin covers is here (thx IW). I don't know if the same person who designed other Penguins did these too, but they certainly share an aesthetic. I would call it sophisticated rather than simple. I like the way the subject matter warms up the modernism of the abstract form. I can't imagine a book about fish cookery today having so many fish heads on its cover, so many dead eyes staring down the prospective buyer. I was thinking something similar the other day while watching the Bouillabaisse episode of The French Chef. Julia starts with fish heads to make her stock and proceeds as well to cook and serve some of the fish for the stew with their heads on. 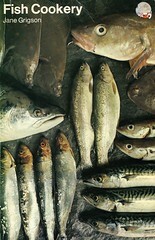 I can't think of a contemporary cooking show that would spend so much time on fish heads except perhaps for Iron Chef. And thinking about fish heads reminded me of that Dr. Demento chestnut: "Fish heads, fish heads/Roly-poly fish heads/Fish heads, fish heads/Eat them up, yum!" -An article in the Guardian about Germano Facetti, who was art director at Penguin from 1962-1971. -Penguin by Design, a book of Penguin covers from 1935-2005 by Phil Baines. When there's a great stack of ironing to do, or you've promised yourself to clean out the closets, do you sometimes just open the refrigerator door at noon, grab the first thing you see, and gulp it down, so you can go on with what you're doing? You're making a big mistake if you do. With your full and busy schedule, it's important for you to take time off in the middle of the day to relax and simmer down. Those few minutes will mean a lot to you after the baby wakes up from his nap, or the children come whooping in from school, or it's time to start dinner. The book's photos, when they contain human subjects, invariably portray girls and women cooking and boys and men consuming. The general feeling, as in so many of these books, is that taking care of the food is an essential mission that guarantees a person's proper femininity. I don't care for the ideology but at the same time I get a kick out of kids working in the kitchen. Now the picture. 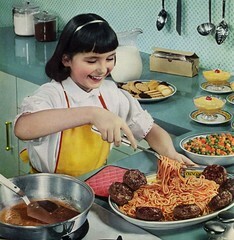 I have always thought of spaghetti and meatballs as a quintessential 1950s dish but in this combination of pasta, red sauce, and meat the meat is cooked as burgers. I would never think of eating spaghetti with hamburgers or hamburgers without buns, but these old cookbooks remind you of how notions of what goes with what change over time. Alternatively, it could be "cute" that the kid prepares a dish that's a little bit funny. Or it could be that the people who wrote this book were wacky. With the exception of the meat, the meal that the girl has prepared is virtually all "instant" in some way. The peas and carrots surely came from a can, the pudding from a mix, the sauce from a jar, the cookies from the box on the counter. One reason for thinking so is that there are no recipes to accompany the shot. It is assumed that the housewife will know enough about how to make these easy dishes to teach her daughter. I wonder if a cookbook today would get away with that. The caption next to this photo on page 53 reads, "Let the children cook...its fun for them and a help to you. Start off with an easy menu...and just see them shine!"